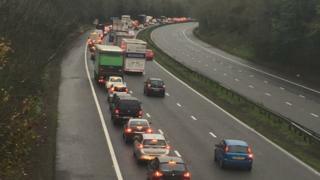 A motorcyclist is in a critical condition after a multi-vehicle crash which closed the M4 westbound near Cardiff. The incident happened at about 07:20 BST on Tuesday near junction 33 (Cardiff West) and the motorway was closed to junction 29 (Castleton). It reopened at about 11:40 after a police investigation. The motorcyclist is being treated at Cardiff's University Hospital of Wales. Queues stretched back from Junction 29 where the road was closed to Junction 24, at The Coldra, Newport. There was also congestion on other roads as a result. At one stage there was a 19 mile (30km) tailback on the A470, which joins the M4 at junction 29, stretching back to Abercynon, Rhondda Cynon Taff. Cardiff Airport tweeted urging passengers to allow extra time to make their flights, while Cardiff Bus apologised for the disruption caused to many of its services. Meanwhile, a five-vehicle crash on the A48 in Carmarthenshire has closed one lane westbound at Nantycaws Road.